It seems that in the years since the excellent Portal and it’s even more excellent sequel Portal 2, we’ve been seeing a small number of games released that can only be described as test chamber puzzlers. Games like Q.U.B.E. that take its players through a series of clean and scientific-looking rooms all filled with an array of tough head-scratching puzzles to solve using some form of gadget or gun. Turns out the Nintendo Switch didn’t need to wait too long before it would receive its own addition to the slowly growing library – ChromaGun. Right out the gate, you definitely get a very Portal-vibe – a voice on a loudspeaker offering ample jabs and jokes at your expense for any failures along with white rooms that have a very laboratory feel about them. There’s no denying the clear similarities between this and Valve’s classic pair of titles. Playing as an anonymous test subject, you’re tasked with trying out the ChromaGun, a modern albeit somewhat goofy looking shooter that can fire different coloured paints onto surfaces around you. The gun itself stores red, blue and yellow paint but through the wondrous power of mixing you’re also able to create green, orange and purple too on surfaces. These are your only available tools but ones necessary in order to succeed in the game. Every room you enter is essentially its own puzzle to be solved, the aim being to position floating WorkerDroids over switches that will then unlock a door allowing you to then move onto the next chamber. To do this you’ll need to use the different coloured paints of the ChromaGun on both the WorkerDroids and other surfaces. Paint one of the robots the same colour as a nearby surface and it will proceed to zone in on said area. Making use of this initially simple mechanic you’ll then be able to manoeuvre the drones around into the positions you need. 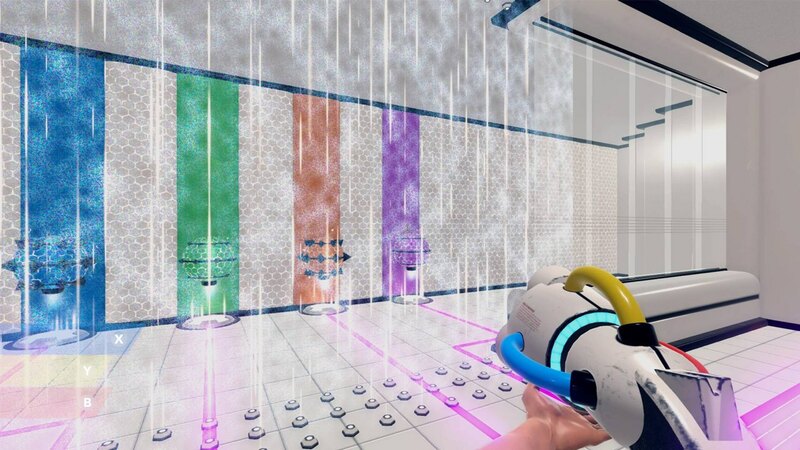 This is the basic premise that ChromaGun revolves around and its one that offers plenty of difficulty the further you progress starting out relatively easy going with simple solutions rarely more than a minute away before requiring you to more complex things like using paints to create momentum in the WorkerDroids, swinging them around corners and such. The WorkerDroids may initially act obediently in a magnetic manner upon shooting them with paint, however, you’ll eventually find yourself facing drones that actively try to attack you on sight or when coated in in a new colour. Even the environment itself becomes more complicated; the game throwing electrified floors as well as walls that eventually clean themselves of paint if left too long. You’d think painting things alone would only be appealing for so long but it is often surprising to see the sheer wealth of ideas developer Pixel Maniacs has managed to squeeze out of this one mechanic. Unfortunately, that does mean the game can suffer from harsh difficulty spikes. Granted I’m not the sharpest when it comes to solving puzzles, but the times where I felt like I was constantly bashing my head against a wall searching for a solution definitely dragged the experience down a little. To make matters worse I would then solve the next puzzle without much issue. A little more consistency in difficulty would have been appreciated. Unfortunately, the game is a little on the shorter side clocking in at around three to four hours long. While those hours are certainly well spent, the quality of the puzzles left me eager to keep playing long after the closing moments. It’s also disappointing there is no two-player option available. Combining colour mixing and teamwork would likely yield some brilliant results and here’s hoping it’s something the developer ventures with a possible sequel in the future. ChromaGun opts for a more minimalistic look where rooms lack detail keeping a rather clean and modern atmosphere. It’s by no means a bad style, but after seeing it done in other games before and often times better it feels a little uninspired. Still, everything is clear and the colours stand out in a way that makes managing them relatively easy. It’s also worth noting that those with colour blindness have also been considered with the game throwing symbols on colours helping make it easier to differentiate between the six. In terms of the commentary, you’ll hear plenty of cutting comments as you progress through the game, a scenario many Portal fans will find familiar. Pixel Maniacs’ effort might share an awful lot in common with Valve’s Portal series but those parallels are only skin deep. At its core, ChromaGun takes something as simple as colours (something we’re all familiar with) to craft an inventive puzzler unlike anything currently on Switch. Outside its short runtime and sometimes frustrating difficulty, ChromaGun is still a smart and entertaining challenge perfect for those that like their brain being truly tested.